This is another card that I made in preparation for the Crazy Crafters Blog Hop with Dena Rekow that I didn't use and ended up orphaned! I do like it though - so it should have it's time in the spotlight. I used Dena's instructions to make the split card from Basic Gray cardstock, which I layered with Whisper White before adding a layer of paper from the new Affectionately Yours DSP pack. I cut a piece of Basic Gray cardstock and embossed it with one of the new Floral Affection embossing folders (there are two in the pack that will be released on 1 June). Then I used a round corner punch. 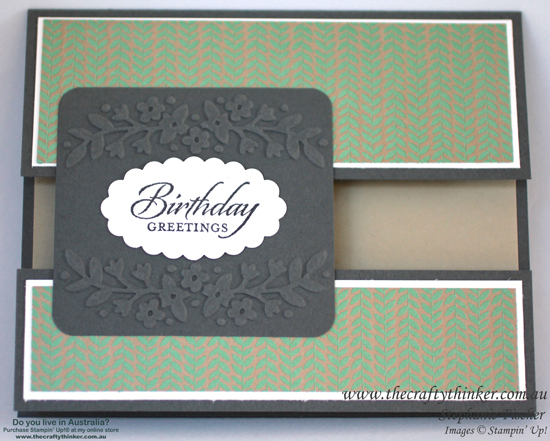 I stamped the birthday greeting from Wetlands with Basic Black ink onto Whisper White cardstock and punched it out with the Scallop Oval punch. This punch is retiring but from 1 June there will be scallop oval framelits available in the new Layering Ovals Framelits. Having glued the birthday greeting to the embossed layer, I attached it to the two pieces of the card front. I added a piece of Sahara Sand cardstock to the inside of the card which shows through to the front, creating a soft but masculine appearance to the card.